In the previous articles of this series, SQL Server Execution Plans overview , SQL Server Execution Plans types and How to Analyze SQL Execution Plan Graphical Components, we discussed the steps that are performed by the SQL Server Relational Engine to generate the Execution Plan of a submitted query and the steps performed by the SQL Server Storage Engine to retrieve the requested data or perform the requested modification operation. In addition, we clarified the different types and formats of the SQL Server Query Execution Plans that can be used for queries performance troubleshooting purposes. Finally, we discussed the graphical query plan components and how we can analyze it. In this article, we will go through the first set of SQL Query Plans operators. The previously created ExPlanOperator the table is a heap table, a table in which the data rows are not stored in any particular order within each data page, due to the fact that there is no Clustered index created over that table. See the article SQL Server table structure overview for more details about the structure of the SQL Server tables. So that, in order to return the result of any query on that table, the SQL Server Engine will scan all the entire table row by row using the Table Scan operator. When you create a Clustered index on the table, the table will be converted from a Heap table to a Clustered table. A clustered table is a table that has a predefined clustered index on one column or multiple columns of the table that defines the storing order of the rows within the data pages and the order of the pages within the table, based on the clustered index key. For more information about the Clustered table structure, see SQL Server table structure overview. And for more information about the Clustered index, see Designing effective SQL Server clustered indexes. 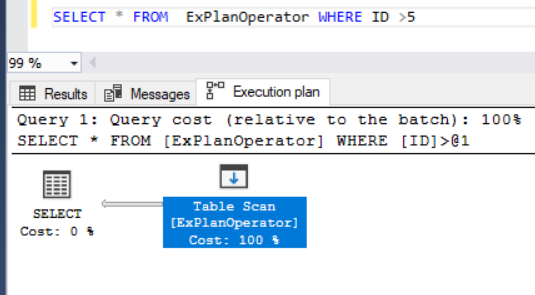 From the previous SQL Query Execution plan, the SQL Server Engine decides to use the Clustered Index Scan operator, although it will traverse all the index rows similar to how the Table Scan operator behaves. This is due to the fact that, the Clustered Index can be considered as a sorted replacement for the underlying table that stores all the table data at the lowest level of the index, also known as the leaf, in addition to the index key. If there is no useful Non-Clustered index due to out of date statistics, or the query will return all or most of the table rows, the SQL Server Engine will decide that using the Clustered Index Scan operator to scan all the Clustered index rows is faster than using the keys provided by the index. Rather than traversing all the table rows, the SQL Server Query Optimizer will locate the appropriate Clustered index and navigate it to retrieve the required rows by providing the SQL Server Storage Engine with the instructions to identify the required rows based on the key values of the selected index. In addition to processing the data quickly to retrieve the needed rows using the Clustered Index Seek operator, no extra steps required to retrieve the rest of the columns, as a full sorted copy of the table is stored in the leaf level nodes of the Clustered index. When the SQL Server Query Optimizer finds that all the data that is requested by the query can be provided by an available index, it will perform a seek against that Non-Clustered index, using the Index Seek operator. For more information about the Non-Clustered index, see Designing effective SQL Server clustered indexes. You will see from the SQL Query Execution plan that, the SQL Server Query Optimizer found that the created index contains all the data that is requested by the submitted query and that the fastest way to retrieve this data is seeking that Non-Clustered index. Recall that the Non-clustered index stores only the index key values and pointers to the rest of columns. If the SQL Server Query Optimizer is not able to find all the requested data in that index, it will look up for the additional data in the Clustered index, in the case of Clustered table, or in the underlying table, in the case of the Heap tables, affecting the query performance due to the additional I/O operations performed during the look up process, as we will see later in this series. In the next article of this series, we will discuss the second set of the SQL Server Query Execution Plan operators. Stay tuned!